Americans may be surprised to learn that sexual harassment is still actively practiced within European Union nations. In the United States women have legal protection against being harassed within the work place. However, there is no international law that protects women from forms of sexual harassment. Working women have the right to feel that when we are at work we will be employed in an environment that is safe. We should not be exposed to unwanted advances by male coworkers or supervisors. I can remember when women began to enter into male dominated work spaces and had to deal with hostile coworkers or with various forms of sexual harassment in the belief that this was acceptable within the work culture. American women began to fight back and work towards demanding that laws be enacted to protect our rights within the workplace. 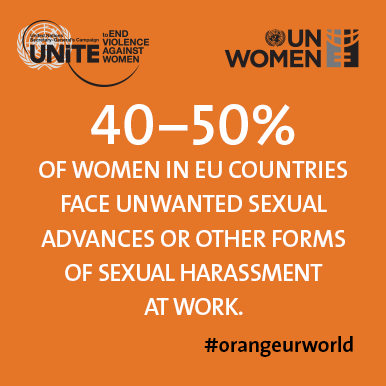 Until I researched the information regarding sexual harassment of women in the EU, I had no idea that there were no uniformed laws established to protect working women in this portion of the world. I have no doubt that there are still forms of sexual harassment occurring in work places within the United States. This type of inappropriate behavior often goes unreported because there is still a prevailing attitude that whatever occurred is still in some way the fault of the woman. Speaking out has a price because it opens up the door to various public opinions that are often verbally abusive towards the woman instead of towards the male. Even though we are living in different geographical regions of the world, we have to address common problems as a global community.